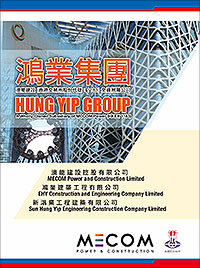 Hung Yip Group (HYG), based on Engenharia Hung Yip as established since 2000, is an integrated construction and engineering consortium in Macau. Our key customers are reputable world-class hotel and resort and casino owners or operators in Macau and leading US-based casino operators; Macau SAR Government; CEM (a sole concession public utility company) and private corporations and organizations. HYG is specialized in the construction of HV Substation projects for CEM. We have established a consortium with Siemens to provide a one-stop "design, build, operate and maintain" turnkey solution to our customers. We ranked top in this market. In 2007, we were awarded the structural steelworks construction contract of City of Dreams. The project comprises a total of 42,000T of structural steel, which is one of the largest contracts of its kind in Macau. The project employed a fast-track construction program and in the month of September 2007, a record breaking erection of 10,000T was achieved. The project was completed and highly appraised by the owner and the management company. HYG had captured the second booming Macau construction market. Since 2012, we were awarded several large scale construction works projects, such as Macau Studio City, Venetian Parcel 3 (The Parisian), Sands Cotai, City of Dreams Retail Extension and Wynn Palace. In July 2014 and subsequently in November 2016, we were awarded the structural steelworks and civil engineering construction contract and site management contract, respectively, for the new hotel at City of Dreams, designed by world acclaimed Zaha Hadid Architects. In April 2013, we were awarded the Gold Award (Hong Kong & Macau Region) by China Construction Metal Structure Association (CCMSA) for our structural steelworks for the City of Dreams project. Once again, in May 2017, HYG was awarded two Gold Awards presented by CCMSA for our two structural steelworks projects, Morpheus at City of Dreams and the Banquet Hall and Theatre at The Parisian. These awards have proven that HYG have completed numerous landmark structural steelworks construction project throughout the years. HYG is a renowned integrated construction engineering contractor and power substation constructor in Macau. Over the years, the Group maintains a team of 400-600 employees comprising various types of professionals, including approximately 120 managerial executives. As a local contractor in Macau, HYG’s most valuable asset is our highly competent work force and management system. HYG emphasizes on safety, quality, efficient management and timely completion of all projects. We will continue to uphold our core value in future development.